April | 2014 | what? bread? I have an old and splattered copy of The New Internationalist Food Book, first published in 1990. It is out of print now, but second hand copies are available. It contains recipes from Africa, Asia and Latin America, worked out for Western kitchens and with some information and food facts. I guess it was published long before we all got exercised about food miles, food waste, eating locally and still appreciating the foods of other cultures. It is a book that I go back to from time to time for recipes and ideas. Today I retrieved it for the Caribbean banana bread. 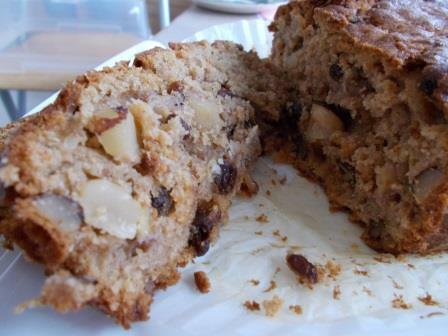 Ingredients are: 3 large bananas, 175 g margarine, 175 g sugar, 225 g flour, pinch of salt, half teaspoon of cinnamon, 2 teaspoons of baking powder, 1 large egg, 125 g chopped walnuts, 100 g raisins or sultanas. 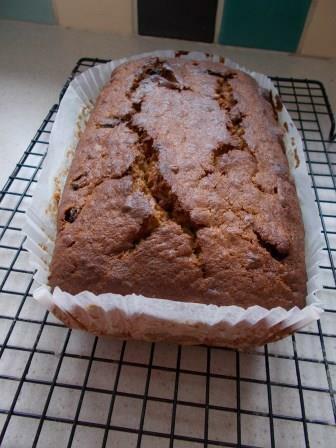 The cinnamon and dried fruit are marked as optional. Instructions: mash the bananas, beat in the margarine, then the sugar, then the dried goods, then the egg, and finally the fruit and nuts. Bake for one and a half hours in a 1 kg loaf tin at 180C. I had a couple of squashy bananas in my fruit bowl and one I’d tucked away in the freezer, so I was good to go. 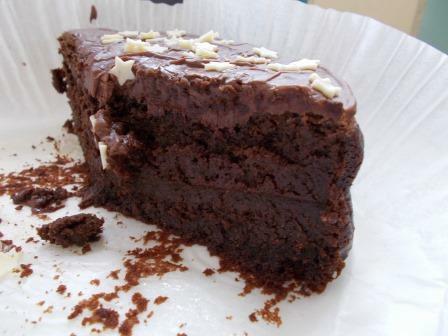 Because the recipe is not specific about sugar, I find it easily accommodates whatever you fancy. Today I went with light soft brown sugar, but another time I might have used a heavier sugar. 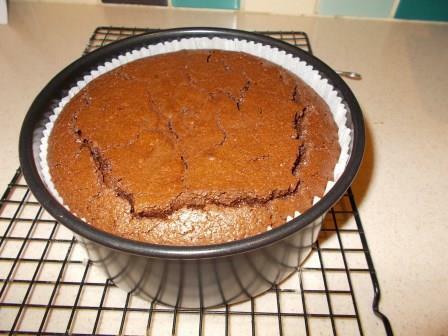 As the recipe only needs plain flour I’ve also tried something for the first time. 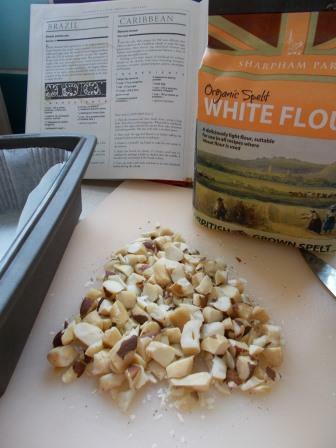 I spotted Sharpham Park Organic Spelt White Flour in Waitrose the other week. As it claims it is suitable to use anywhere white wheat flour is used, I’m taking them at their word. 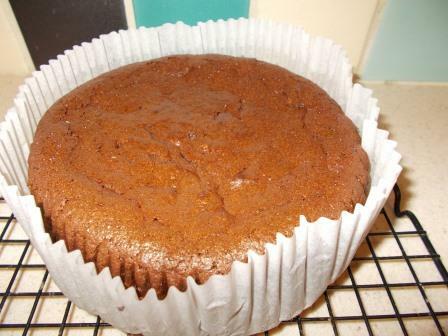 I have used spelt flour in baking before, but not in cakes so far, unless it was just a bit mixed into the carrot cake recipe. I’ve also replaced the walnuts with some chopped brazil nuts. 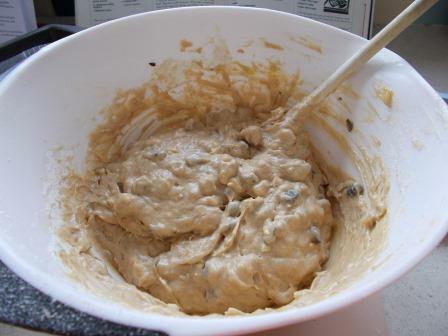 Some pictures below of the mixture, and then one of the finished result. 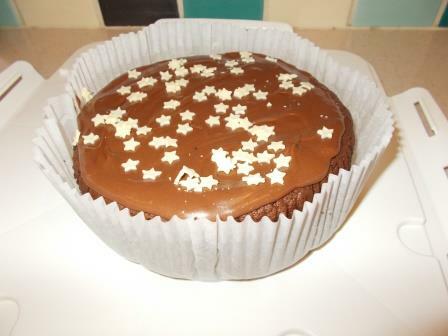 It takes quite a while to cool down, but finally after the wait I can say that the cake was …. delicious, or as my husband said “you wouldn’t know there was anything different in it”.